it’s now quite common for my leftist friends to simply assert that lower living standards are an acceptable result. For all intents and purposes, hurting the rich is more important than helping the poor. Indeed. In my book The Rise of Big Government I account for the anti-growth rhetoric that has been coming out of leftist outlets for many years now. It should no longer be surprising to anyone that the left accepts economic stagnation as a method to eliminate economic differences. In fact, so long as we apply a relative definition of poverty - a man is poor if he earns a certain percentage of median income - it does not matter if those at the bottom of the income ladder can afford a house, a new car, $100 sneakers and frequent restaurant dinners. They are still poor if median income is "too much" higher than theirs. For clarity: I am not suggesting that people living on the dole in America today have this standard of living. Of course not. The point is instead to illustrate the absurdity in defining one man's standard of living in terms of another man's standard of living. It is, namely, an established truth that in a growing, thriving economy some people will become fabulously wealthy, while others will see their standard of living grow more slowly. It is an equally established truth that what the left sees in this statement is an injustice - one man prospering faster than another man - and that they will try to remedy that by thwarting economic growth. This is not just a rhetorical point. It is a truth easy to detect in economic data from countries where the left has been able to put their policies to work over an extended period of time. The following two charts report data from 27 European countries over a period of ten years, 2005-2014. They demonstrate, with chilling clarity, that the bigger the welfare state is, the more stagnant the economy will be. 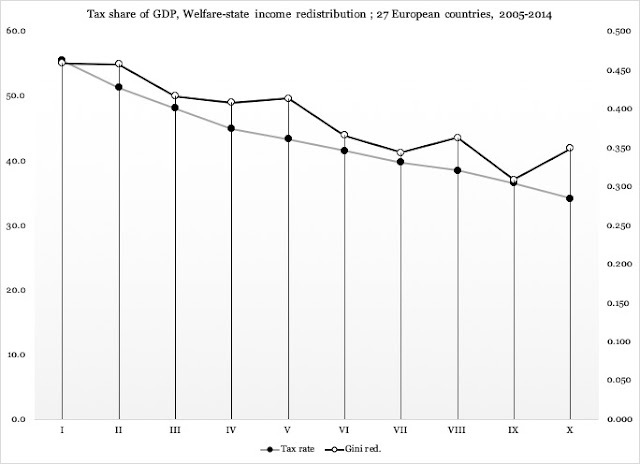 The first chart compares the total tax burden, measured as total tax revenue as percent of GDP, to the welfare state's effect on income distribution. The latter variable is measured as the reduction in the Gini coefficient, from the income distribution as it is prior to the welfare-state entitlement programs, to where it is after those programs are taken into account. 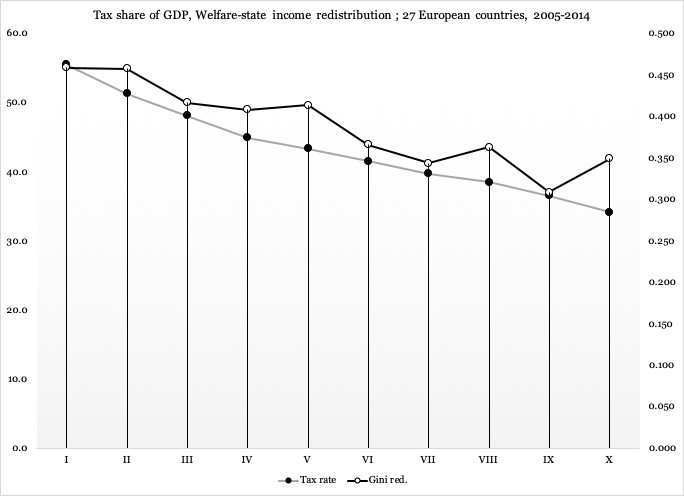 As the welfare state goes deeper into the economy to redistribute more income, taxes rise; when the welfare state backs off, taxes are lower. Two pieces of information are added to Figure 2 that were not present in Figure 1. The first is the solid horizontal line at 2.0 percent economic growth rate (left axis). This is the IP Threshold, i.e., the growth rate below which an economy is defined as being in industrial poverty. It is not a matter of a year or even two, but a sustained period of time. 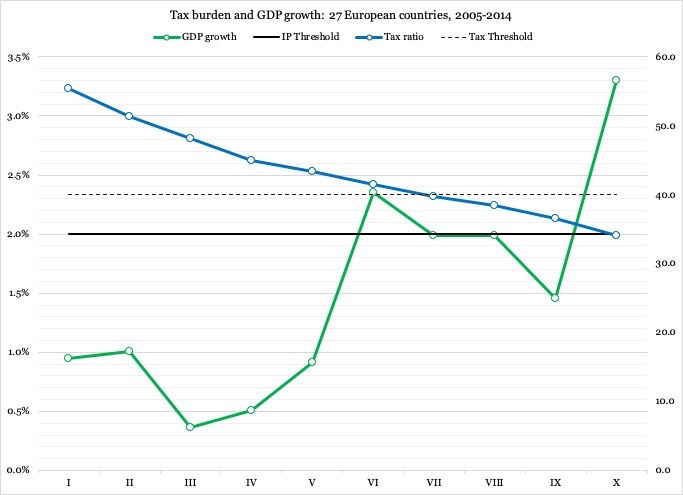 The second horizontal line is dashed and represents the 40-percent tax-to-GDP ratio (right axis). It is generally observable in macroeconomic data that when taxes on an economy exceed 40 percent of GDP, growth starts tapering off and the slide into industrial poverty begins. In the third segment, from decile IX to decile X, taxes drop to 35 percent and GDP growth takes off to exceed three percent per year. Tracing our numbers back to the reduction of the Gini coefficient, Figures 1 and 2 demonstrate that in order to move an economy closer to the socialist ideal where there are no income differences, we have to bring the economy to a standstill. In a world without growth, there are no opportunities for the poor and the middle class to advance their standard of living. Therefore, the only possible outcome in terms of economic "equality" is equal poverty. That includes forfeiting technological advancements in engineering, medicine, IT, energy production and transportation. It means freezing the technological standard we live with, indefinitely. Forget finding new cures for diseases; forget innovations that make expensive electric cars affordable to everyone; forget new technology to build and operate high-speed trains. In fact, a zero-growth economy will not even remain standing still. It will move backward. As I explained in my book Industrial Poverty, it takes two percent growth per year just to maintain the standard of living we have. Growth rates below that actually prevent us from even reproducing our way of life as we know it. This obsession with so-called economic equality represents a lethal threat to the very prosperity and survival of the Western world, especially America. As demonstrated by the numbers I reported above, Europe is already sinking. The question is: will we follow? So long as the left hates the rich more than they love the poor, they will bring us all with them over the cliff into the dungeon of poverty, stagnation and social and economic decline. Once there, America will never recover. Ever. *) The only difference is that the tenth decile only contains 26 observations. The reason is that there is no data for the first year in the series, 2005, from Lithuania. Alas, the total number of observations of each variable is 269, as opposed to 270 in Figure 1.